PHUKET: Koh Lone School will receive their first free wind turbine in August following a joint initiative by a Japanese manufacturer and the Phuket Provincial Energy Office (PPEO). PPEO Chief Jirasak Tummawetch along with representatives from A-Wing Co Ltd, the Thai affiliate of the Japanese small wind turbine manufacturer, made the announcement at a meeting with Phuket Vice Governor Somkiet Sangkhaosutthirak. A-Wing set up operations in Thailand to lower production costs and better supply the ASEAN region with their products. The planned turbine has a production capacity of 1,000 watts and will be a step toward relieving Koh Lone, located off Phuket’s southwest coast, of its electrical supply issues. “Each Koh Lone household currently pays about 2,000 baht a month to run their generator, but this only provides them with four hours of electricity per day. They are having trouble,” Mr Jirasak said. “We are drawing up a plan to request 18 million baht from the Ministry of Energy and a Swedish fund in order to install wind turbines, solar panels and hydroelectricity generators on the island so that residents have access to a continuous supply of electricity,” he added. Mr Jirasak explained that one small wind turbine could generate enough electricity to supply a single household. “This wind turbine can start generating electricity at wind speeds as low as 1.5 meters per second… I think wind energy can be harnessed to supply power for streetlights and small hotels,” he added. Arine Thongsthit, business coordinator at A-Wing explained that the company is aiming to bring electricity to areas where there has been no previous supply. “A-Wing International donated four 500-watt wind turbines to Koh Paluay in Surat Thani in February as part of the Ministry of Energy’s Green Island project,” she said. 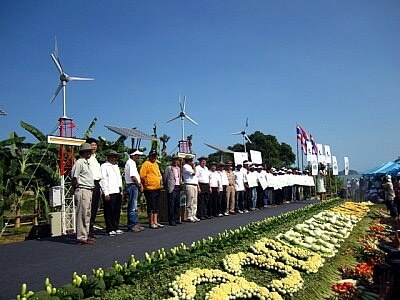 Big Buddha Hill was a potential site for the next wind turbine installation, Mr Jirasak said. “Wind speeds there reach about six meters per second, which is quite strong when used for producing energy. I think we should support the temple with wind turbines because it is still relying on generators,” he said.